On The Dime: Is it here yet? I have an International Business presentation this week on Thursday (which is not only Cinco de Mayo but dead day at my school). I have been putting it off like any self-admitting slacker does by talking to MKM for almost an hour, going to get chili cheese tots and corn dogs with DR at Sonic and writing this. My part is only 3-5 pages which, I will be able to write in an hour and a half/two hours tops when I finally decide to focus on it. One thing that I learned from being a communications major was how to spin something out of nothing. While I was putting off writing my advertising/ marketing plan for my presentation I made a pie. I found the recipe in one of my Southern Living cookbooks (would I be a girl raised in Alabama if I did not at least have one). 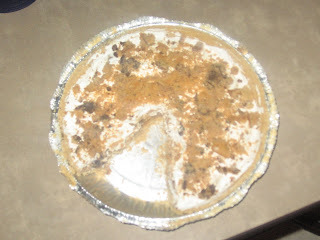 It was an easy cookie pie. I usually take recipes and change them to my liking so I did not use the type of cookies that the said. I made one for my friend SCH with the new Chips Ahoy White Chunk cookies. It ended up being really delish. The one I made myself has Soft Batch cookies in it. It still turned out ok but wished they had the Rainbow Chips Deluxe cookies in store. They were sold out and I was not happy. Guess I should go be productive and write this plan. School work, here I come!! !